kindle version, from the publisher -- thank you! Before I launch into Sharecropper Hell, let me introduce Chalk Line Books. Their motto: "eBooks to die for!" The simple but cool logo makes me want to buy the t-shirt, and if they had a tote bag, I'd buy that too. Seriously. 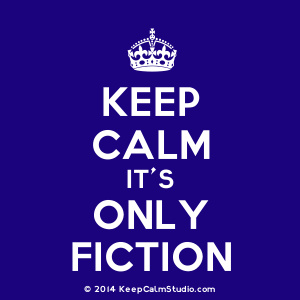 As they say on their website, they are all about "republishing vintage crime fiction classics as ebooks". You don't get much more vintage than Jim Thompson, but they also have another book out right now by David Goodis, The Secret Squad, which I have now have on my Kindle. 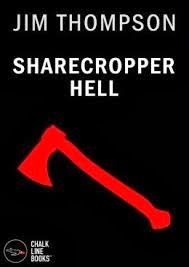 Moving on to Sharecropper Hell, this novel was published originally in 1952 as Cropper's Cabin, and it's my introduction to the work of Jim Thompson. It's pretty dark, although not quite what I was expecting. While there is a crime, the focus is mainly on the central character, 19 year-old Tommy Carver -- who is arrested as a suspect in a murder he didn't commit -- and his relationship with his father, simply known here as Pa. This is one of those novels where after finishing it you might feel like you want to wash your hands: it's got an excess of male pride, lust, and a character who on the surface shows himself to be a disgusting pig of a racist, while hiding much worse underneath. That doesn't mean the book is a bad one -- just that this story delves deeply into the darkness of human personality, and it ain't pretty. However, there is an upside -- and that is in the character of Tommy. Set in Oklahoma, the novel follows Tommy Carver, who with his father does sharecropping for wealthy Native American landowner Matthew Ontime. Tommy is having a relationship with Ontime's daughter Donna, but it has to be kept a secret. Tommy's dad, Pa, spares no bones in telling Tommy just what he feels about "half-breeds" and other Indians, and his hatred toward Ontime is fueled largely by Ontime's refusal to let the oil companies come in, lease his land, and drill for oil. Pa and Tommy have a 10-acre plot of their own, but it's surrounded by Ontime's land, and not much value to the oil companies without the rest. When an oil scout dangles the promise of wealth in front of Tommy's dad, things come to a head with Ontime -- later, when Ontime is murdered, it's Tommy's knife they find in him. Pa can vouch for Tommy's whereabouts at the time of the murder, but says nothing. As Tommy goes through his trial, and Pa never speaks up, he has only one thing on his mind -- revenge. He knows that whatever happens he's going to survive, if only to get even with his Pa. While the setting is dreary and depressing, and at some points kind of hokey, my take on this book is that in a kind of roundabout way, this book is a coming-of-age novel. In many ways, while Tommy is academically smart and shows a lot of promise, his pride is what does him in. For example, he stands with his father against Ontime, because his Pa tells him that the money from the oil company would take care of Tommy for the rest of his life. He even slings a few racial epithets at Ontime, and even at Donna, very unlike him but very much like Pa. But after Ontime is dead, after the trial, after everything, Tommy begins to understand the truth of things. There's a bit of optimism at the end, which I wouldn't have expected just because of who the author is, but if you frame the whole thing as a coming-of-age story, albeit a very dark one, then the ending makes sense. 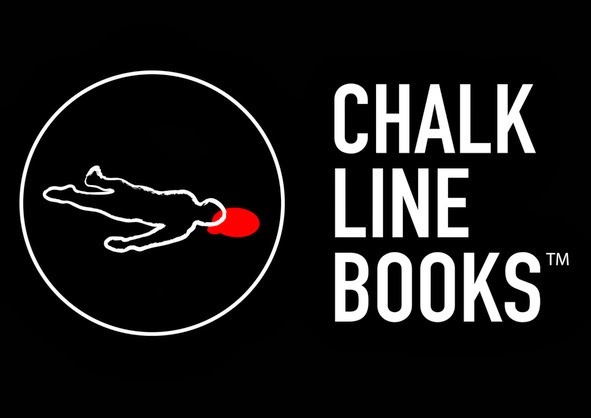 I'm looking forward to reading Chalk Line's next book, and I'm excited to see what they come up with in the future. I'm still a newbie to the old hardboiled, noir and pulp fiction, but as I read through these novels, I'm really liking them. What a lot of them have in common, and this book is no exception, is that they paint a picture of the past -- the people, the issues, and the darker side of humanity that has always existed among us. Goodis is another author I haven't yet read, so I'm looking forward to it. I have a lot of Thompson and Goodis on my shelves, but have read neither. Thanks for your comment!